130 Beds, open to all, without distinction of race or color. 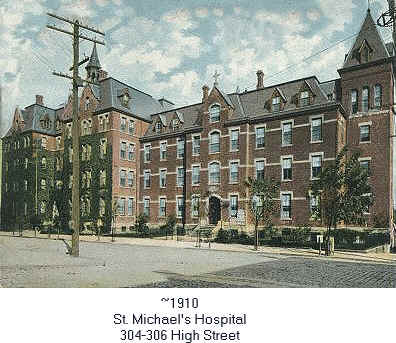 Saint Michael's Hospital was incorporated by the Sister of the Poor of Saint Francis, a Catholic order, in 1871. The original hospital was in rented quarters at 69 Bleecker Street. The present site at Central Avenue and Martin Luther King Blvd. (High Street) was acquired in 1869. Money for the building of this facility was raised through a general subscription in the Catholic Churches of Newark. The Catholic community met the challenge and in 1871 the hospital building was built. During the building of the hospital, patients were treated in the house and stable on the lot. After completion, three outpatient clinics were added, one for eye and ear diseases, one for the treatment of diseases of the throat and chest, and one for skin diseases. The hospital was an overwhelming success with people needed to be turned away. A controversy occurred when the Catholic Church asked the Common Council of Newark to appropriate ten thousand dollars to the hospital. The reigning newspaper of the times, the Newark Daily Advertiser, opposed the appropriation on the grounds that the Constitution forbade public aid to any religion. The newspaper stated that although the hospital was opened to all, it had the ability to propagate the Catholic religion to its patients. The Common Council of Newark agreed and the measure was defeated. St. Michael's Hospital is one of the best equipped institutions in the State of New Jersey and some of the ablest and most distinguished physicians and surgeons of Essex County. have been identified with its medical and surgical staff. This institution which is little more than a quarter of a century old, had to its credit on January 1, 1897, 93,086 patients treated. St. Michael's is the largest hospital in the city and has a central location on the corner of High Street and Central Avenues and has three hundred beds and, like her sisters, has all the necessary accessories and all the paraphernalia of a first class hospital. Even though St. Michael's is nominally a Roman Catholic institution and the bishop of the Newark Diocese stands at the head of its protecting Board of Directors, the hospital is managed entirely by the Sisters of the Poor of St. Francis, thirty-two in number, at the head of whom is Sister Perpetua Superior. Yet all the doors are open to people of all creeds and nationalities. The key to its wards lies in the affirmative answer to the question, are you sick or afflicted? Lest we might neglect such as all important duty of paying a tribute to this noble order of women whose charitable work is going ceaselessly on all over the world, we will repeat on this page, and in the language of a Protestant Minister, who had been nursed by them and said, "The Sisters are an eminently holy and pious body of women." Under the auspices of the Catholic Church, but supported by the general public and admitting patients of all faiths. Offers medical and surgical aid and nursing to the sick and disabled, suffering from acute, curable, and non-contagious diseases. Admits tubercular cases. Capacity, 270: two hundred and sixty ward patients and ten private. Admission to the hospital is by direct application. Charity cases taken by application to the Overseer of the Poor and on the written permit of a City Physician. Hospital under charge of the Sisters of the Poor of St. Francis. On a side note, this is the hospital the Old Newark webmaster was born in.